מחליפו של הממיר NuWave DsD אשר זכה לשבחים רבים בארץ ובעולם. והן בפיצ'ירים רבים ומאידך להישאר בתחום המחיר השפוי. בממיר ה- NuWave DsD וביחס התמורה למחיר – VFM. דבר המצריך כבל חשמל נוסף, מדף, אינטרקונקט וכדו'. אשר לא שייכת ולא נראתה עדיין בממירים בגיזרת המחיר של הממיר החדש. 3 כניסות אנלוגיות + כניסה אחת XLR. קראו את הסקירות הרבות על הממיר Stellar Gain Cell Dac (קיים במלאי – שלם וקח). 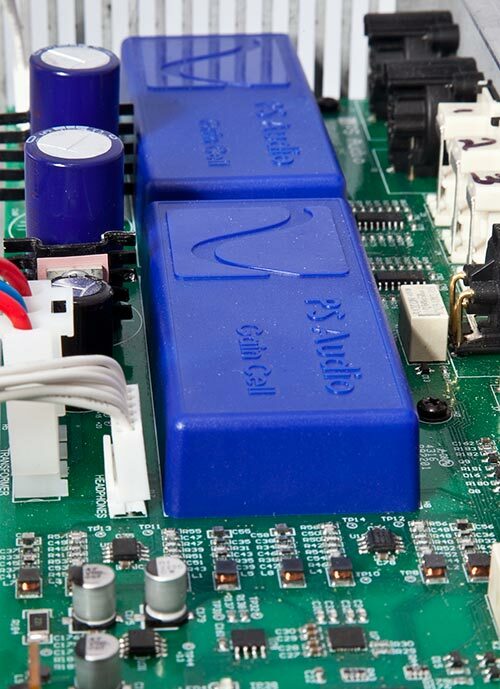 The Gain Cell DAC will transform your expectations of what’s possible in an under $2,000 DAC. Based on an improved version of our NuWave DSD, the performance of the Gain Cell DAC is unparalleled in this price category, or anywhere near. The Gain Cell DAC produces a seamless 3D soundstage from even normal CDs. Labored over by its chief architect, Bob Stadtherr, and hand-tuned and voiced by Paul McGowan and Darren Myers, the improvement in sound quality over other DACs is astonishing. The Gain Cell DAC accepts inputs from any digital source including I²S and USB from your computer and outputs directly through Stellar’s analog Gain Cell preamplifier with either single ended (RCA) or balanced (XLR) connections. Used with music server software like JRiver, Bit Perfect, Amarra or Pure Music and an iPhone or Android app, the Gain Cell DAC becomes your entry into the world of high-end digital audio music, both PCM and DSD. Performance is superb at anywhere near the price and there are good reasons why, as you’ll soon discover. In fact, the Gain Cell DAC is one of the best sounding products we have produced in our 24 years of building DACs. Sweet, spacious and effortless, this device will bring the life back into your music and all at the touch of a finger. All input signals are taken into the Gain Cell DAC in Native Mode, without Sample Rate Conversion (SRC) and fed directly into a simplified FPGA known as a CPLD (Complex Programmable Logic Device), which discovers sample rate and format, reclocks all incoming data, reduces jitter, waveshapes data output to the DAC chip, and utilizes high speed/low gate count logic to reduce propagation delay for faster throughput. This proprietary technology is called the Digital Lens. The DAC chip itself is the acclaimed 32-bit ESS Sabre Hyperstream architecture, the output of which is passively filtered to reduce transient distortion. the Gain Cell DAC’s power supply includes a large analog transformer, 7 regulators, properly-bypassed high-speed switching diodes, and a massive 15,000 mFd of storage capacitance. The output stage is a unique Class-A configuration, fully balanced and direct coupled hybrid array (utilizing both discrete semiconductors and ICs), with an extended bandwidth of -3dB at 60 kHz feeding directly into Stellar’s Gain Cell. The Gain Cell DAC features a high-resolution USB path based on the same XMOS technology found in our DirectStream DAC. Asynchronous and capable of 24-bit 192kHz performance for PCM and single or double rate DSD, the Gain Cell DAC USB input sounds every bit as good as the best digital audio is capable of. Using a high-quality USB cable between the Gain Cell DAC and your computer creates an instant media server that can be controlled through any number of handheld devices like an iPad, iPhone or Android using a 3rd party controller program. Your entire music library can be managed by iTunes, JRiver, MConnect, Windows Media Player, Foobar, Pure Music, Bit Perfect, Media Monkey, Audirvana, or Ammara (to name a few) for ease of use. If you have yet to experience the pleasure of scrolling through your entire music library and selecting the next track at the touch of a finger, you’re in for a quite a treat. With the Gain Cell DAC and a USB cable you can stream both PCM and DSD high-resolution audio, using nothing more than your computer and a handheld device to control and play your entire music library. I²S is the native format of all CD transports and many servers. I²S features a separate clock and data signal from the source. Typically, this clock and data signal are multiplexed together to be transmitted over a single cable in a format known as S/PDIF (Sony Philips Digital Interface), or AES/EBU (Audio Engineering Society/European Broadcast Union). Once received in multiplexed form, the DAC input must untangle the clock and data and once again separate them. I²S solves the problems associated with unraveling data of S/PDIF and AES/EBU formats. I²S outputs are sent via an HDMI cable and sources with I²S outputs can be purchased from PS Audio as well as other manufacturers. The Gain Cell DACs I²S inputs are also compatible with our DirectStream Transport. What this means is important. The DirectStream Transport is one of only a very few players to output pure DSD from the locked SACD layer of SACD discs. Only PS Audio DACs, such as DirectStream and DirectStream Junior—and now Stellar—are authorized to play the pure DSD layer in all of its glory. The Stellar Gain Cell DAC offers the choice of three digital filters for users to select from. Each digital filter has a different sonic character and the choice of filters offers an excellent means of improving system synergy. No filter choice is wrong or right. Instead, each filter can be selected and auditioned by the user to more perfectly match their chosen collection of the amplifier, source, and loudspeaker, as well as personal tastes and biases. Users can relax and use the supplied remote control to audition each of the three filter choices for best audio quality matching the system it is played on. Should users upgrade their amplifier, speaker or sources at some point, Stellar is there to help maximize performance. Once the digital audio data have been processed through the Gain Cell DAC’s ESS Hyperstream 32 bit DAC, it’s time to turn them into music and this is the job of the analog filter and output stage. Most DACs use an active filtering system to clean up the output of the internal DAC but this can add a harsh, bright sound to the music. In the Gain Cell DAC, we use all passive analog filtering giving our output a sweet, open sound unencumbered with harsh digital artifacts. The real challenge designing the Gain Cell DAC was making sure both PCM and DSD were handled in a way that sacrificed as little as possible through the playback process. Entry level DACs that accept both PCM and DSD typically favor one format over another when it comes to voicing the device. The two designers of the Gain Cell DAC, chief engineer Bob Stadtherr and CEO Paul McGowan, worked together for nearly a year making decisions on power supplies, overall architecture, developing a custom, simplified FPGA for the input stage and voicing the output stage in a balanced and musical manner that honors both PCM and DSD formats. The first choice was easy. Both Stadtherr and McGowan chose the ESS line of Hyperstream 32 architectures for the chip’s unrivaled sound quality. Important to both designers would be bringing as much musical detail as possible out of Red Book CDs, and reducing the sonic gap between 44.1kHz/16 bit performance and high-resolution PCM and DSD. Lessons learned from years of building DACs aided design decisions critical to the mission of few musical compromises. We believe that one audition of a simple CD, played through the Gain Cell DAC, will open your eyes to the magic these design efforts have brought. And once you hear what the Gain Cell DAC does on ordinary CDs, we can’t wait for you to hear what the Gain Cell DAC can do for higher resolution PCM and DSD. לא מצליח להבין איך היצרן הזה מצליח להפתיע כל פעם מחדש. ישר מהאריזה ונשמע כמו ממיר שעולה פי 4 ממחירו. ממיר משובח ומבית בעל שם עולמי. סניף ירושלים: רח' המחנכת 64, ירושלים.